We love being able to provide you with the freshest seasonal fare that NC has to offer. We are transitioning to some wonderful Spring dishes and looking forward to what our local farmers will have in store for us as Spring advances. Join us this week and check out what Chef Tom and his incredible Kitchen Team will be preparing! As Spring sets in and the weather begins to warm, Chef Tom is ready to bring back NEW versions of our Fresh Featured NC Salads. Check in this week to find out what our first offering of 2019 will be. From our friends at Locals Seafood, we have NC Rockfish. This meaty fish will be Pan-Roasted and served with Grilled Asparagus, Charred Onion Hash, and finished with a White Wine-Mustard Jus. 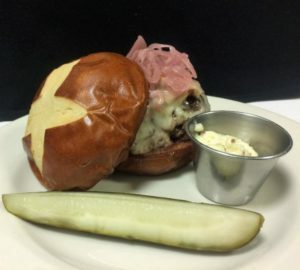 In the Tavern, try our featured Burger made with Certified Angus Beef topped with Prosciutto, Swiss, Whole Grain Mustard Aioli, and Pickled Onions on a Pretzel Bun. Look for a NEW dessert, as well… later this week, we’ll have NC Pecan Tart served with homemade Mint Julep Ice Cream made with the first fresh Mint from Chef Tom’s own herb garden. We are pleased to announce that we are a finalist for “Best Steak In Wake County” with Indy Week! Thank you for all your help, but it’s not over yet. Finalist voting will resume April 8th through May 5th. We will provide you with a link next week. In the meantime, thank you if you have already voted for us in the Wake Living Reader’s Choice Awards. Voting ends soon, so if you have not voted yet, there is still time! You have helped us earn the title of “Best Steak House in Wake County” for 6 years in a row and we’d like to ask you to help us make it 7. Follow the link below to cast your vote in the Wake Living Reader’s Choice Awards. 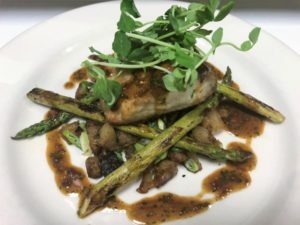 Pan-seared NC Rockfish, served with Grilled Asparagus, Charred Onion Hash and finished with a White Wine-Mustard Jus. In the Tavern, this week’s Featured Burger includes Prosciutto, Swiss, Pickled Red Onions, and Whole Grain Mustard Aioli, all on a soft Pretzel Bun.